Since the late 1970s, China has experienced an unprecedented pace of urbanization. In 1978, only 17.8% of the population resided in urban areas, but by 2013 the level of urbanization had reached 53.8%. During the same period, China also enjoyed spectacular economic growth. China had become the second largest economy in the world by 2012, just behind the United States. Despite China’s highly acclaimed achievements in urbanization and its economic miracle, urban China confronts a set of significant challenges. This book provides theoretically informed and empirically rich analyses of some of the key challenges facing China’s urbanization. The first part deals with new patterns of urbanization, focusing on comprehensive measures and environmental dimensions of urbanization. The second part of the book focuses on several aspects related to migrants in cities: migrant entrepreneurship, return migration, and local people’s attitudes toward migrants. The final section examines two key issues important for migrants, urban local residents, and policy-makers that have become quite contentious in China today: housing and urban health care. 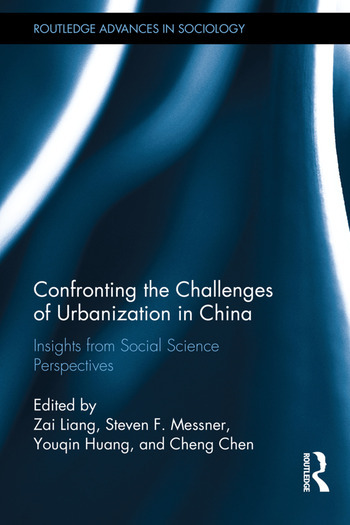 This collection presents original, cutting-edge research on some of the most pressing challenges confronting contemporary urban China, conducted by researchers from multiple social science disciplines. It will appeal to scholars and advanced students of urban studies and China studies, as well as those in sociology, anthropology, geography, and political science. Zai Liang is Professor of Sociology and co-director of Urban China Research Network at the University at Albany, USA. Steven F. Messner is Distinguished Teaching Professor of Sociology at the University at Albany, USA. Youqin Huang is Associate Professor of Geography at the University at Albany, USA. Cheng Chen is Associate Professor of Political Science at the University at Albany, USA.